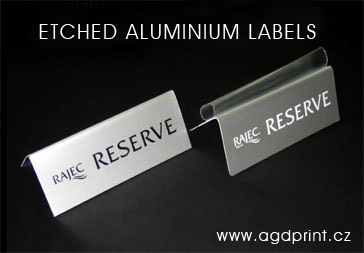 Thanks to our latest technology we are able to produce aluminium labels, when every piece is original. We print technical labels for machines and equipment with all the data you require. Even with such labels the price is significantly lower than our competition! Contact us and convince yourself! In case you would like to advise with the graphic design, we are ready to help! We would be glad to advise you how to achieve the efficiency as well as beautiful look of your labels. Everything will be ready according to your requirements and after your agreement we will start the production. Sample pieces can be made in very short delivery dates.